More and more vintage replica dolls are being released. 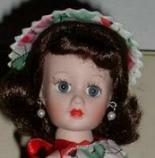 I collect vintage dolls and also love these new replicas made in the vintage style. Rini resembles the smaller version of the Dollikin doll from 1958. Charisma released a new version of the Candy Fashion Doll giftset that was originally released in 1962. I was lucky enough to find a one of a kind prototype of a porcelain reproduction of the Little Miss Revlon doll that was never released as Little Miss Glamour. My porcelain Crissy was released by the Danbury Mint as a new version of the grow-hair Crissy doll.